Do your part and send your vote home! 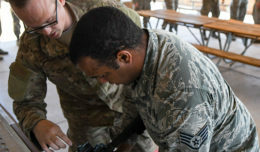 DAVIS-MONTHAN AIR FORCE BASE, Ariz. — The ability to cast your vote and elect officials is a fundamental right that all U.S. service members defend on a daily basis. For many military members and their families, driving to a voting center and casting a ballot on Election Day is not possible. With the U.S. Presidential Election on November 08, 2016, and over 50% of Congress up for election throughout the fall, exercising your right to vote may be easier than you think. 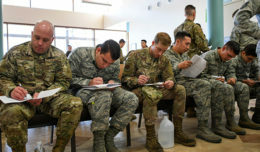 Many military members and their families may think they are unable to vote due to being stationed away from home states or deployed during the election. These service members and their voting age dependents can still vote in every election, but there is a specific process to complete first. Fortunately, most states now offer online services for voter registration and absentee ballot requests. The Department of Defense’s Federal Voting Assistance Program (FVAP.gov) consolidates this information, providing guidelines and individualized state directions. The first step in voting away from home is registering. If you already registered, request an absentee ballot to be mailed to your current address. Both of these items are accomplished by using the Federal Post Card Application (FPCA). All states accept the FPCA form, which can be mailed, faxed, and even emailed, depending on what your state allows. The FPCA form can be found in hard copy from your local Unit Voting Assistance Officer (UVAO) or at the Installation Voting Assistance Office located within the Wing Legal Office, Building 2300, on the second floor. The FPCA form can also be filled out electronically using FVAP’s “Online Assistant” (https://www.fvap.gov/citizen-voter/registration-ballots). This great tool walks you through each step of filling out the FPCA correctly, and customizing the form to the state you are registered to vote. After your FPCA form is received by your local election official, an absentee ballot will be sent to the address indicated on the FPCA form. It is important to submit your FPCA form at least 90 days prior to an election, so there is time for processing and mailing of your absentee ballot, and for it to be returned prior to the election so your vote is counted. Follow the instructions on your absentee ballot to ensure your vote is received by the correct day! But what happens if you forgot to send in your FPCA in time? Or you did, but still haven’t received an absentee ballot in the mail? Don’t worry, that’s what the Federal Write-in Absentee Ballot (FWAB) is for. This option gives service members and their voting age dependents “another shot at getting their vote counted,” says Captain Kate Murphy, Installation Voting Assistance Officer. If an absentee ballot has not been received 30 days before the election, this form functions as a backup ballot which you hand write (or type) your votes. It is important to also fill out an FPCA to send with the FWAB, as the FWAB can only be counted if postmarked by the election date and if the FPCA has been submitted. At Davis-Monthan, a plethora of people and resources are available to assist with absentee voting. Each unit has a Unit Voting Assistance Officer (UVAO) who distributes voting information to all service members in the unit and, if requested, provides additional voting assistance. In addition, Captain Murphy and her staff of core UVAOs work with the Federal Voting Assistance Program to educate voters. Absentee Voter’s Week is coming up, from June 27th to July 5th. During this week, a booth manned by UVAOs will be set up at the Base Exchange to answer voting questions or assist members with the voting process. The Installation Voting Assistance Office is also available throughout the year. Voting is taking action, voicing an opinion, and making a choice. “People feel like their vote just isn’t going to count,” Murphy adds. 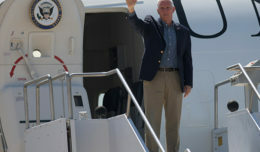 “Well, you know, if you don’t vote, definitely your voice isn’t going to be heard.” To ensure everyone gets the opportunity to vote, Voting Assistance Programs across the DoD are required to provide voting information early and often to military members and their voting age dependents. Voting is not only a right we defend, but a civic responsibility, as a citizen but also as a member of the military. Do your part, and send your vote home!